I was one of those kids that watched just about every show on television and could only fall asleep if the TV that was in my room was on. When I discovered one of my friends did not have cable, I couldn’t help think how abnormal it was. Now fast-forward to today’s time, and I am the abnormal one. While streaming shows is becoming much more accepted and popular, my husband and I still get a lot of weird looks when we say we don’t have cable. However, by streaming our favorite shows through Netflix, Hulu, and Amazon, we have saved three things. First, we have saved over $1000 a year by cutting the cable. The number seems a little too large to be true, right? Well, it isn’t. Cable would cost us an extra $100 a month. Sure, there are tons of deals and bundles right now, but usually you only get a specialized rate for a year. So even with the special rate, we would be spending an extra $600 a year. Secondly, we save a lot of time. We are the type of people that would watch television just to watch it, which can be a bad thing. Why waste your time to watch shows like Hoarders or Tanked just because it is the only thing on at that moment? With Netflix and Hulu, we know which shows we want to watch and don’t watch much else. Finally, it saves a lot of stress. Okay, maybe not a lot of stress, but definitely some degree. We babysat my sister-in-law’s kids one weekend and thought we would enjoy their ginormous television package with over 900 channels. It was Friday night, so it would seem pretty easy to find several good shows or movies to watch, right? Wrong. It was a little stressful scrolling through hundreds of stupid channels (infomercials and such) and trying to find something we both could agree on. I think we wasted an hour just trying to find something on. I am sure once you get use to your channels it is easier to find something, but I do still think it is ridiculous to have so many channels, yet still so very few selections in good things to watch. With Netflix and Amazon, it is also nice to know that my children will be able to watch their favorite shows without ever seeing a commercial. This means I will not have to get dozen of requests for a Barbie with blue hair that turns into a dolphin underwater or for those special chicken nuggets with green goo in them (these two products are totally made up now, but don’t be surprised if they become a real thing). So now you know. My decision to stay cable free is much more than just saving money. It is nice to save a huge chunk of money, but it is also nice to know that something does not control my time, my stress, and my finances. 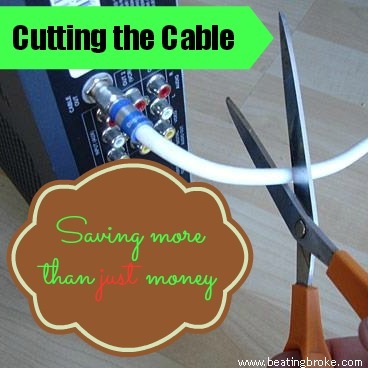 What would you save if you went cable free? Ashley Eneriz is a freelance writer and thrift store/yard sale queen. She blogs about saving money and making money at home through her site The Thrifty Wife. We’d save about $100 a month, and I’m keen to do it! Cable is the worst value purchase in most households, imo. I don’t know if I would save much. My cable is roughly $600 per year and I view it as part of my entertainment. There is a cost for the other services although some are free. I have been cable free for a little over 2 years. I picked up two over the air antenna’s to get some broadcast stations and I ended up getting around 25 channels. I love saving the money and I like having more time to enjoy whatever I am doing. I would definitely save if I cut the cable. I really want to, the only thing that is holding me back is sports. Our local teams are all on a cable channel for 95% of their games. If I could find a way to legally stream live sports, cable would be gone in a heartbeat. Honestly, we never got used to all the channels and then Time Warner revamped and renumbered them and we can’t find anything! The only thing we use cable for is college sports and my husband is ready to give up on that now. I think we will get a high def antenna so we can watch some local channels for news and then everything else is Appletv, etc. I always enjoy reading these stories though we’ve never really considered the idea of cutting cable. I think we make our savings count in other areas. It’s all about priorities. We don’t watch an excessive amount of TV but we enjoy the setup we have and we pay what we consider a fair price. We saved $800 a year. Like you said even better was saving time. Once you leave it behind you realize how little you really need it. Plus I’m in better shape!